If your idea of a perfect holiday is pottering in French markets, enjoying delicious local food, buttery croissants and crisp baguettes fresh from the local bakery each morning, time to relax by your private pool at a self-catering villa, peaceful nights under the stars with a glass of wine….you get the picture, Disneyland Paris is probably not high on your list of places to visit. I would have been in complete agreement. 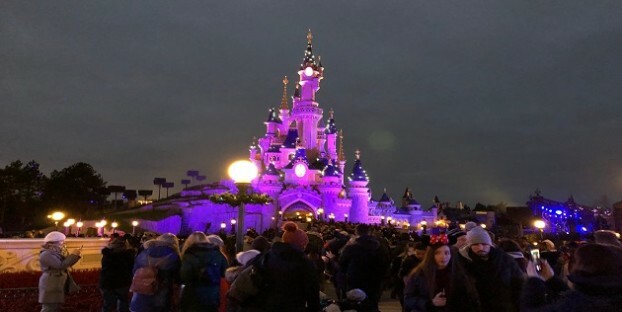 But as a Disneyland Paris veteran of three visits I can honestly say that it can be a wonderful addition to a family holiday that even the most cynical parent can enjoy! Make the most of your magic hours! The key, for me, to getting the best from Disneyland Paris is to make it an ‘add-on’ to your holiday, not the main focus. Conveniently situated some 3 hours drive from the ports of Caen and Le Havre it can be an ideal stopover on your journey down to the southern regions of France. Book a night or two in resort accommodation to break up your outward or homeward journey – there are many to choose from ranging from the luxury Disney Hotel to more budget friendly holiday parks close to the main site. The main benefit of staying on site is accessing an extra hour of time in the park before it opens to the general public. This means you’ll be able to get a chance to do your favourite popular rides without the queues! Disneyland Paris itself is split into two parks; The Disneyland Park home to the iconic Sleeping Beauty’s castle and four zones covering Pirates, Fairy Tales, Space and the Wild West, and the Walt Disney Studios Park where you’ll find attractions based on special effects in the movies, insights into animation and famous names in the Disney franchise including Finding Nemo and Toy Story. My most important piece of advice is to plan, plan, plan! If you just wander in you’ll spend so much time finding out where things are and queuing that you may miss out on the parade or ride you most wanted to see! Take into account the age of your children and don’t try to do too much. Perhaps pick one must-do ride each and plan those into your day. There are timetables showing when the parades and meet-and-greets are happening and where, and for the major rides you’ll need to be prepared to queue unless you’re willing to fork out extra money for queue-jumpers or fast passes. Don’t worry too much about the rides. The Disney castle (and the dragon in its lair beneath) are amazing. There are plenty of themed play parks and areas to explore that are part of the scenery with no queues required including Alice in Wonderland’s maze, pirate caves and a Wild West outpost. See a parade. Get in position early so your little ones get a good view. It can be very busy so it’s worth planning your spot in advance, it will be well worth the wait! If your child is mad about Disney Princesses consider booking the eye-wateringly expensive dinner at Cinderella’s restaurant. All the main princess characters are there mingling and chatting with you as you dine, and it’s the only way your child will get a real chance to talk to them instead of queueing up for a quick photo at the park meet-and-greets. Unmissable rides: It’s a Small World, Snow White and the Seven Dwarves, the Dumbo ride and the boat trip around miniature scenes from fairytales. If your children want to hit all the ‘big’ rides it may be worth spending the extra for fast pass tickets. Queues at peak times can reach over two hours, and though you can use the time to eat lunch if you plan ahead there’s no denying that queues are not fun even at Disney! Use your magic hour wisely and start with the most popular rides before they get busy. Divide and conquer – if you are able to split up so you can accompany children to the rides they most want to do and meet up later that can work well. Kids don’t like queueing for a ride they don’t want to go on just because a sibling wants to do it! Plan to break up the day by seeing some shows and parades. In the Walt Disney Studios park there are various theatre, cinema and stunt shows to watch that are really entertaining and a great chance to have a sit down and rest when all the walking gets tiring. Unmissable rides: Star Tours, Pirates of the Caribbean, Ratatouille, Buzz Lightyear Blast and Autopia. At this age let the kids plan the day prioritising their favourite attractions and strategizing for minimum queuing! Be prepared for the numerous gift shops; the ‘merch’ will be tempting and pricey so have some idea what you’re willing to spend before letting them loose in the stores! Unmissable rides: Crush’s Coaster, Star Wars HyperSpace Mountain, Rock ‘n’ Roller Coaster, Big Thunder Mountain. In summary, having never really wanted to visit Disneyland I have now thoroughly enjoyed three visits there making magical memories as a family. You can pack a lot into a couple of fun but tiring days at the park, and then move on to fields of grape vines and sunflowers, days by the pool and on the beach and a well deserved glass or two of wine. Plan your holiday to the South of France with us to get 20% off your Brittany Ferries crossings, and book a stopover at Disneyland on the way for major parent points without sacrificing the holiday you want, and need!